I purchased a Nikkor 35mm f/1.4 AI lens a while back off of eBay. The seller listed the item free of fungus, dust and oil. Sadly there was so much oil on the aperture blades that you couldn't close the aperture. The seller agreed to have it cleaned at his expense. One trip to Nikon Canada, $170 and 3 weeks of waiting and I had a clean lens. I'm not sure what Nikon Canada did, but the aperture blades showed signs of oil about a year and a half later. This time I was not willing to spend that much money myself, and have to wait that long. So I started on the quest to take my lens apart. I never really sat down to do it in one big go. It ended up taking months to even get to the aperture blades. So much for having it sooner than 3 weeks. Mostly unrelated to this, I've purchased a house with my fiancée and needed to clean, sort, organize and pack. Having this lens taken apart on my desk had to be remedied. 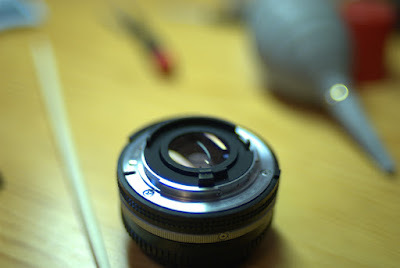 I got determined, and armed with a few bad photos I had taken of the teardown and the Chinese forum post, I set out to rebuild the lens. I decided to detail it here for anyone who will need this info in the future. This is the build up, not tear down. Just follow it in reverse for taking it apart. The tools used were the Wiha #26199 Slotted & Phillips Tool set. This is an excellent screwdriver set. You will need something similar in quality where the philips screwdriver tips are well made and will not strip the screws. The main screwdriver I needed that I was missing was a 1mm flat head (slotted) screwdriver for one of the grub screws. To clean the lens I used the Nikon Professional Cleaning kit (only available from Japan as far as I know). From that kit I mostly used the cleaning fluid dispenser and the lens paper. The cleaning fluid used was Anhydrous Ethyl Alcohol (99.9% pure alcohol). The aperture blades have little nibs on both sides. See picture for orientation. Make sure they overlap in the correct order. Sorry, I didn't check this photo until after the lens rebuild. It's a tad blurphy (yes that's a word :). The main ring goes over the aperture blades and the slots going around the ring go over the nibs facing up from the blades. I spent a bunch of time wiggling the ring to get all the blades to sit properly. There is a tab that sticks out from the ring. This goes into the slot closest to the bottom of the main cylinder. The copper shaft sticks up from the blades. There is then another ring that goes on top. I missed taking a photo of it. You'll see in the following photo the orientation to the pin sticking out of the ring from the previous bit. This ring has a screw on shaft that pokes out the side of the inner housing. You'll see this in a later photo. On top of this goes the last ring for the aperture mechanism. This bit is tricky as there is a spring loaded guide that goes in place over the other two rings. The photo shoes the orientation and the placement. Go slow with placing this final ring in as the spacing is very tight. This ring also has a spring which then loops around the shaft from the first ring. I used a small screwdriver to get the spring on. This is the return spring for stop down metering. I did not take the main lens group apart. It was clean inside the group so I only cleaned the outside. It treads in without issue. There are three main threaded rings that go on the end of the lens. An inner ring with a grub screw whole, an outer ring and the branding ring that goes on the inside of the first ring. Screw in the main locking ring and the Nikkor branding ring into the main group now. My apologies for missing some photos here. The main locking ring is the one you need the tiny slotted screwdriver for as it has a very small grub screw. The focusing collar was a real pain. The reason is because it's double threaded. It can go in one of two ways. The first time It went in it was the wrong way. The result is that the mating tab wasn't in the right position. I don't know how you no this until you have the outer housing on and can test the focus throw goes end to end. In this photo the focusing element was screwed in the wrong way. I did not take apart the outer body of the lens as I didn't have to. I may do this at a future point to smooth out the focusing action. The important part here is the two tabs. The one on the left is for the focusing tab from step 4. The tab on the right is for the shaft from the second aperture mechanism ring which you had to screw in from the outside of the inner cylinder. You'll also see a notch at the end. This is for a guide screw that sits below the copper ring of the inner housing. The second lens group screws into the focusing collar pictured on the left. You can also see the shaft from the second aperture mechanism ring here. Please note that the screws holding the third aperture mechanism ring in this photo are wrong. Lastly you'll notice the guide screw mentioned above to the right, holding the copper ring in place. The depth of field gauge slides on very tight. It took me a while to get it on. Do not screw it in yet until you've placed the aperture ring on to see where the guide and indicter dot for the aperture should be. The aperture ring goes on fairly easy. There is a small shaft on the main body that slides into a notch in the aperture ring. I should have taken a photo of me inserting the mount. there is a long tab that goes into the lens. This is the stop down tab. This tab is then held in place with a smaller ring that goes in last. You can see them both in place and screwed down here. The inner ring of the mount is held with three small screws. Two of them are countersunk, one is not. Look at any other AI or AIS lens for position of the non-countersunk screw.